the old town of Sukhothai surrounded by the ancient ruins. is renowned for the ancient temples, Loi Krathong festival, and the splendid nature like Khao Luang.Within the distance of 427 km. from Bangkok, you can easily visit this province by all kinds of vehicle. From Bangkok, there are 2 routes to Sukhothai.The first one, follow the Highway no. I past Nakhon Sawan to Kamphaeng Phet,then follow the Highway no. I 0 I past Pran Kratai district and Khirimat district to Sukhothai downtown.The distance is around 440 km. in total. Another way, follow the Highway no. I to km.50 or around Bang Pa-In junction,Ayutthaya, then take the Highway no.32 past Ayutthaya to Nakhon Sawan. After that take the Highway no. 117 to Pitsanulok and take the Highway no. I2 to Sukhothai downtown. The distance is 410 km. in total. 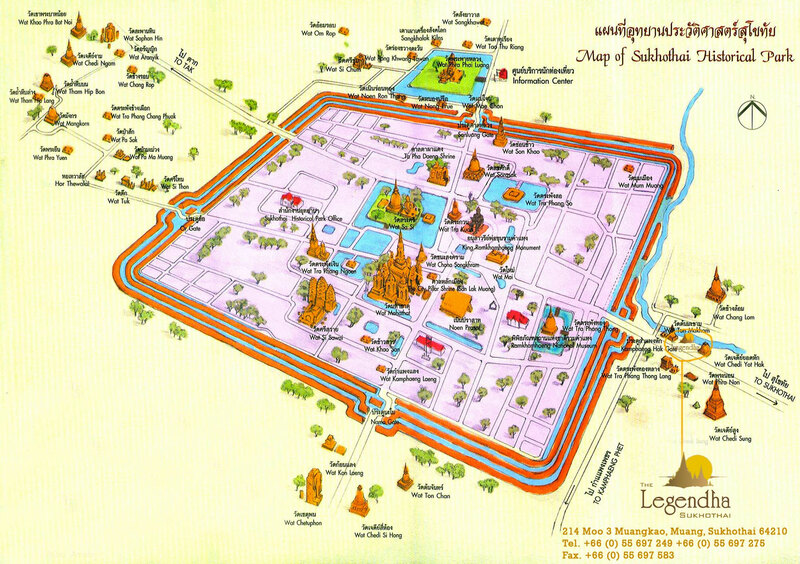 Legendha Sukhothai is set in the Old Town area near Sukhothai Historical Park. By driving, it could take around 5 hrs from Bangkok city center to reach Sukhothai Old Town. Please use GPS coordinates 17.018451, 99.719722. Bangkok Airways flies from Bangkok (Suvarnabhumi airport) to Sukhothai airport daily. The flying time takes only 1 hour. Sukhothai Airport is 40 kms towards the north of the town. There will be airport transfers organized by the airport to deliver the travellers to their reserved accommodations in Sukhothai. It will take only 40 mins. You will find the transfer arrangement desk at the entrance of the airport. Alternatively some low cost carriers such as Air Asia files to Phitsanulok departing daily from Don Muang Airport. Being a low cost airline, the cost is slightly lower but the travel time from the airport to Legendha is relatively longer. It is 86 km from the airport. It will take approximately 1.30 hrs journey time. Air Asia transfer costs 250 baht / person to bring you right to Legendha Sukhothai Resort in the old town. Private bus companies operating daily service to Sukhothai are such as Win Tour (Tel: 0 2936 3753 or 0 5561 1039), Phitsanulok Yan Yon (Tel: 0 2936 2924-5, 0 5525 8647) Sukhothai Bus Terminal (Tel: 0 5561 3296) If travel from/to Phisanulok terminal, a bus leaves the terminal every half an hour. It takes approx. 1 hour from/to Sukhothai town. If travel from/to Chiangmai terminal, a bus travels via Tak (service from 7:00 p.m. to 2:00 a.m.). It takes approx. 5 hours 30 mins from/to Sukhothai town.